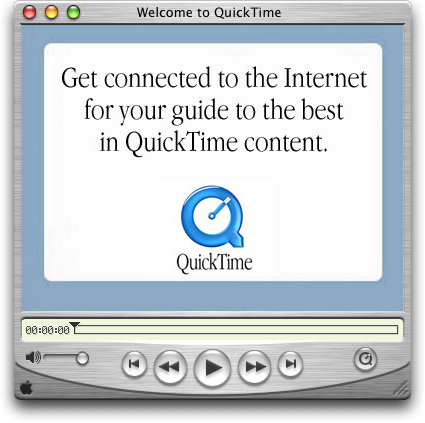 QuickTime Player from Apple allows the Playback of QuickTime movies (.mov) and many other formats.The new QuickTime Player not only delivers startling quality, but it's easier to use than ever. QuickTime Player requires no set up for content that streams over the network. Instead, QuickTime Player automatically determines your system's connection speed and chooses the highest quality stream for the amount of bandwidth you have available. ...... Instead, QuickTime Player automatically determines your system's connection speed and chooses the highest quality stream for the amount of bandwidth you have available. And if you ever lose a connection while watching streaming video, QuickTime Player automatically reconnects. Now, that's convenience. Qweas is providing links to QuickTime Player 7.7.1 as a courtesy, and makes no representations regarding QuickTime Player or any other applications or any information related thereto. Any questions, complaints or claims regarding this application QuickTime Player 7.7.1 must be directed to the appropriate software vendor. You may click the publisher link of QuickTime Player on the top of this page to get more details about the vendor.